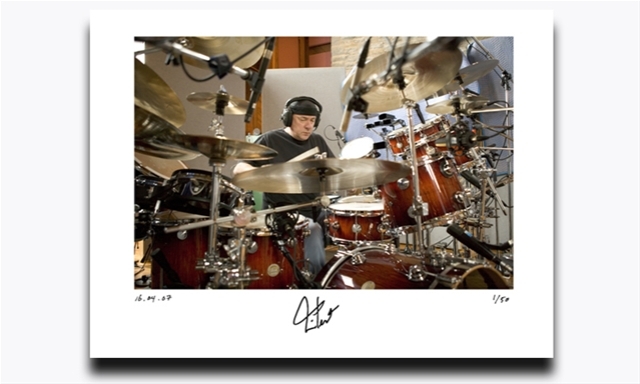 Rush's photographer Andrew MacNaughtan has a new Rush "Snakes & Arrows" series available for purchase. The sales of this series will go to charity. Here is Andrew's intro from his website. The intro also includes some information about the documentary he directed, which will be included on the DVD version of "Snakes & Arrows." For years, I've wanted to make a documentary of Rush in the recording studio, and tell the story of the process of making an album. So, it was the opportunity of a lifetime to be a "fly on the wall" and capture rare footage of the guys at work on their upcoming release, Snakes & Arrows. The documentary, entitled The Game of Snakes & Arrows, was filmed over the course of 20 days at a beautiful studio in New York's Catskill Mountains. The band gave me unprecedented access into their creative process and I had the privilege to witness first hand the writing and recording of their songs. In fact, I was able to capture on film a rare moment of Geddy jamming on his bass as he created a new song for the album. To complement the documentary and to celebrate the release of the new CD, Rush have agreed to sign a very limited edition of prints to raise money for several of my favorite charities. These photos were shot exclusively at the studio sessions, during the filming of the documentary. This is a rare opportunity to own a little piece of Rush history, and it's all for a good cause!